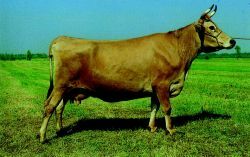 a breed of fawn, mulberry or gray, dairy cattle often with black pigmentation of the skin. Products: Angia is incorporating LeeMah's SafeAccess technology into three of its PC Card modems: SafeJack 28. Headquartered in Provo, Utah, Angia Communications is an industry leader in data-communications products for portable computers. SafeJack, SafeSend and I-bahn are trademarks of Angia Communications.